As the craziness of the biggest Google hardware launch ever winds down, we're seeing some more promotions pop up for the Googley goodness. According to the support page, you can score $25 off a Home or Home Mini if you order from Walmart and Express. While knocking $25 off the original Home is nice (similar to the Christmas sales last year), getting $25 off the Mini is a whole 50% off. Wow. The purchase must be made through Walmart via Google Express, and it appears to be U.S.-only. The Home or Home Mini must be activated between today and January 15, 2018 — the sale ends on January 31, 2018. My guess is this is a rebate, based on the "Coupon will be automatically issued after linking account to Walmart.com" condition. On a side note, it looks like Google is also offering a free month of YouTube Red with Home and Home Mini purchases. And for you U.K. buyers, you don't get the $25 off, but you do get three free months of Red instead. Canadians, you get three free months of Google Play Music — quite the, uh, deal there. Oh, and there's something about 20% off a Domino's pizza. Yay. It seems that the Home Mini has not gone live on Google Express yet, so be patient. When I saw this, I completely misunderstood its content and intent. 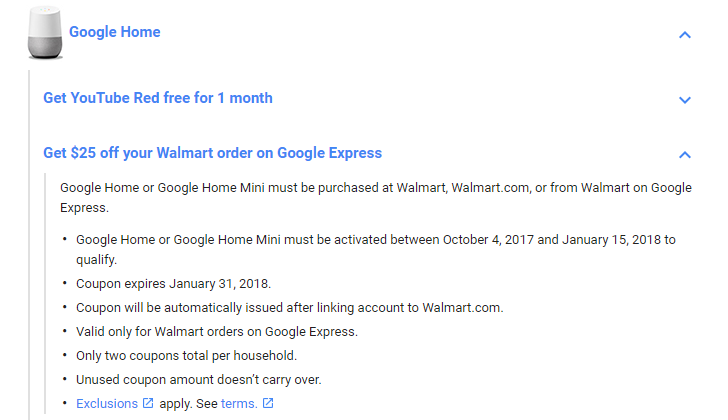 You do not, in fact, get $25 off a Home or Home Mini; instead; you get a $25 coupon off your next Walmart order (when you link your account to Google Express). We – I – apologize for the confusion and incorrect information. Suffice to say, I jumped the gun and didn't pay attention. 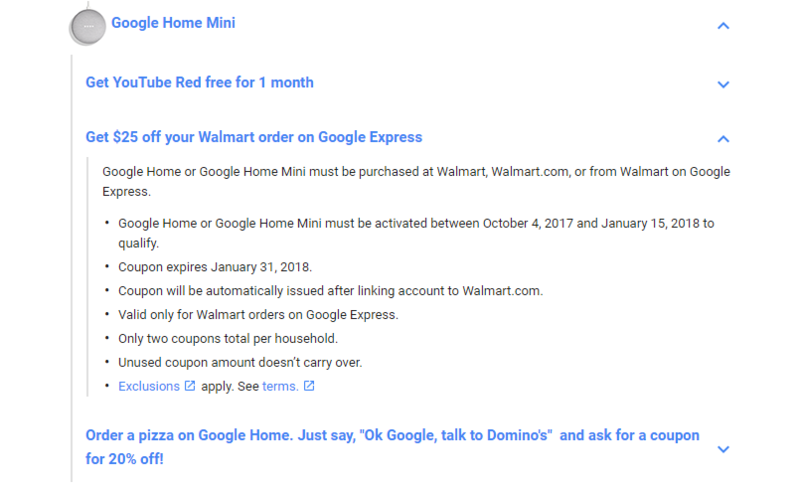 "Starting today, any customer who buys a Google Home or Google Home Mini from Walmart will receive up to $25 off* a Walmart order when they link their Walmart account to Google Express." So there we have it. Still not a bad offer, but not nearly as good as what I originally thought it was. As one commenter put it, "Buy one, get another at half price (at a later date, using the coupon from the first one)." Remember, you have to buy the Home or Home Mini from a Walmart store, from the retailer's website, or from Walmart through Express. Feel free to check out the source links within this update box for more information on how to get your Home or Home Mini, as well as your coupon through Walmart and Google Express.